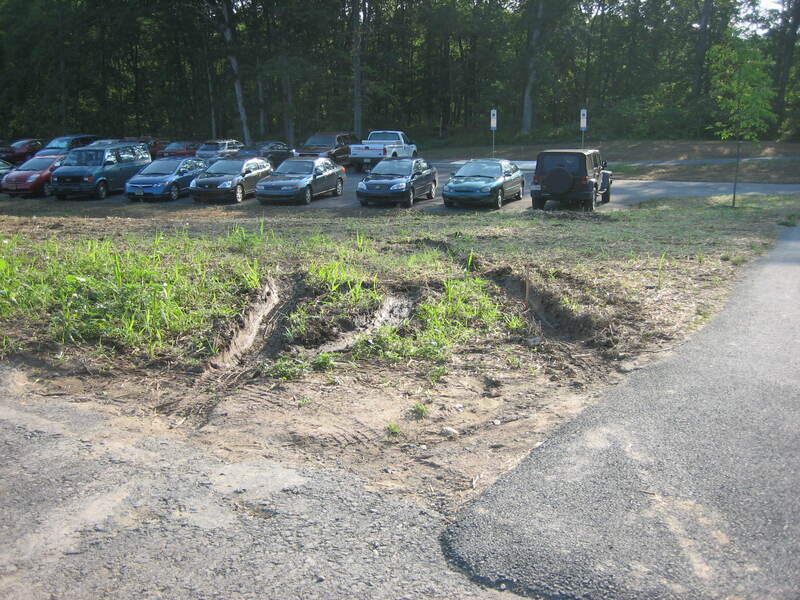 More than a few visitors to the new parking lots at Gettysburg National Military Park this weekend decided that when they couldn’t find a place to park on the pavement, they would park in the mud. The park is having a landscape company place rocks in these areas to deter visitors from parking there. 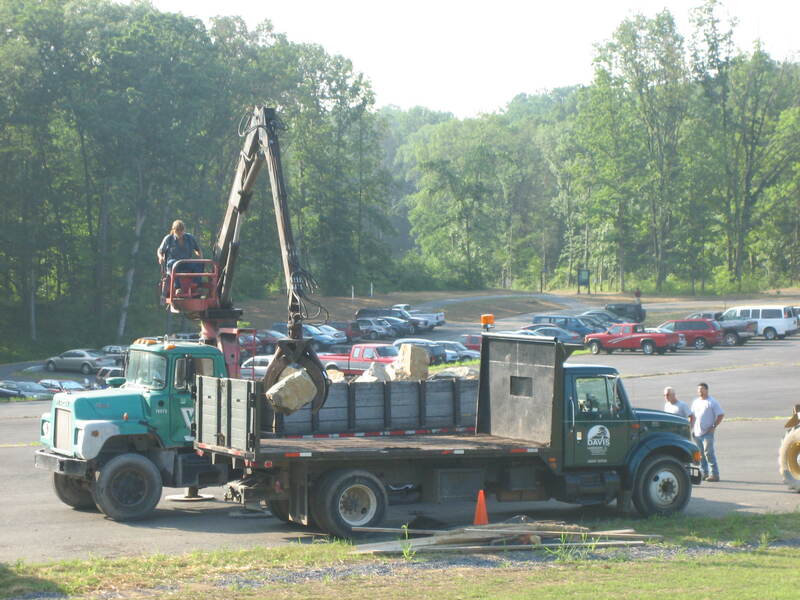 Here Valley Quarries loads large rocks on the truck from Davis Landscaping in Parking Lot # 3. This view was taken from the northwest facing southeast at approximately 8:30 AM on Tuesday, July 8, 2008. The busiest weekend of the year took a toll on the parking lots at the new visitor center. We have had rain the last couple of weeks, and the non-paved areas are muddy. That didn’t stop many visitors, however, from parking in the mud, causing deep ruts, and in some cases having their vehicles stuck. 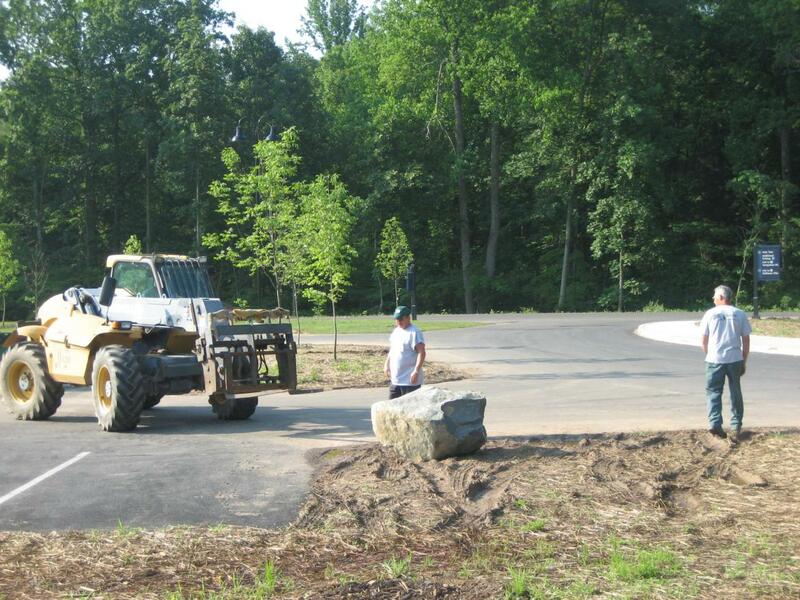 The landscaping company who has been working on this area, began to place large stones in the areas where visitors are not supposed to park. They began with Parking Lot #1, and if they don’t get to Parking Lot #2 today, they will try to finish it tomorrow morning. Parking Lot #3 will not have many stones, if any. 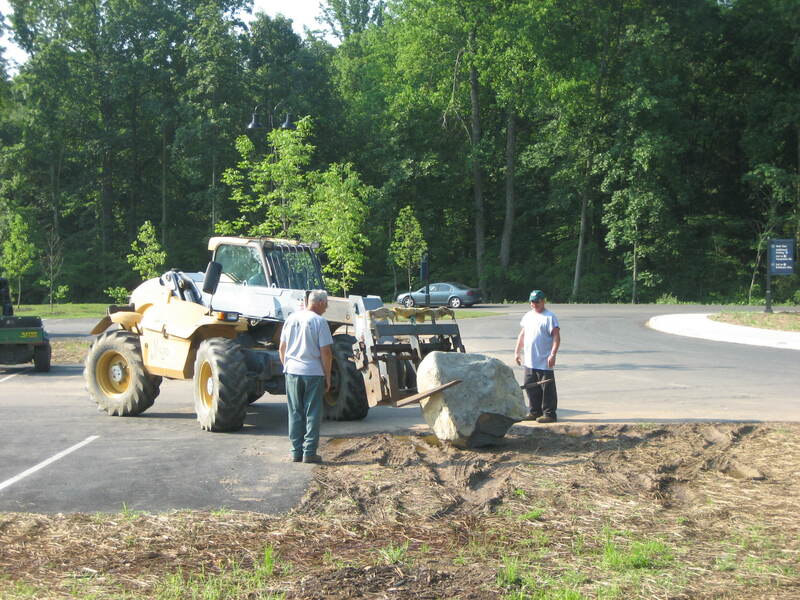 For the Gettysburg Daily’s previous attention to visitor center parking, see our post on May 3, 2008. 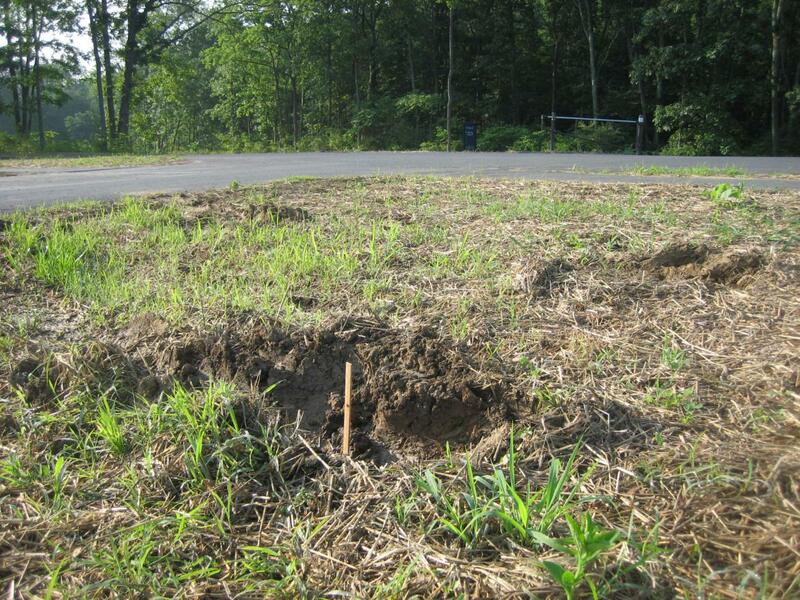 Here is an example of some of the ruts in Lot # 3, and this was not the worst area ruined. A ruler is in the right rut, showing it is almost a foot deep. This view was taken from the southwest facing northeast at approximately 8:30 AM on Tuesday, July 8, 2008. Another view of a rut in Parking Lot #3. The ruler again shows it is approximately one foot deep. Some cars stuck in the ruts had to be pulled out by tow trucks. This view was taken from the northwest facing southeast at approximately 8:30 AM on Tuesday, July 8, 2008. 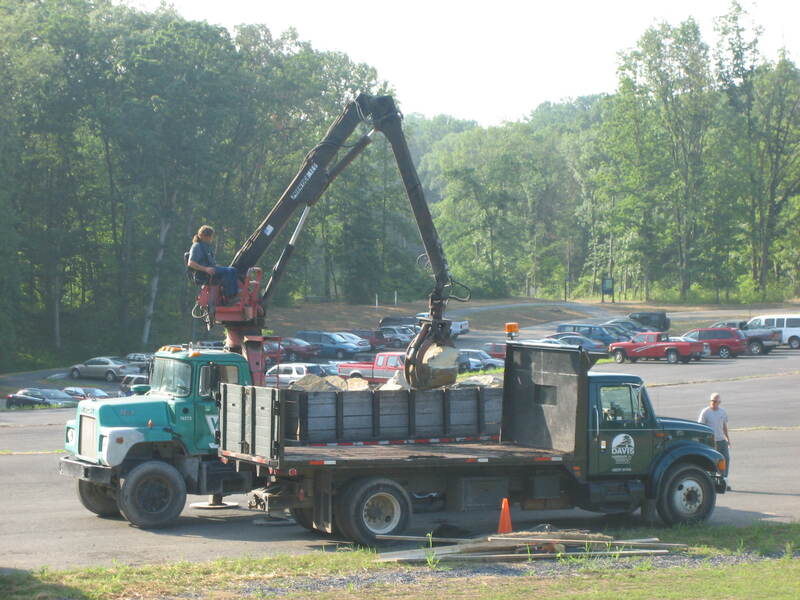 In the upper part of Lot # 3, Valley Quarries loaded large stones on the bed of the truck from Davis Landscaping. The rocks were then slowly driven down to Lot #1, which suffered the most damage this weekend. This view was taken from the northwest facing southeast at approximately 8:30 AM on Tuesday, July 8, 2008. 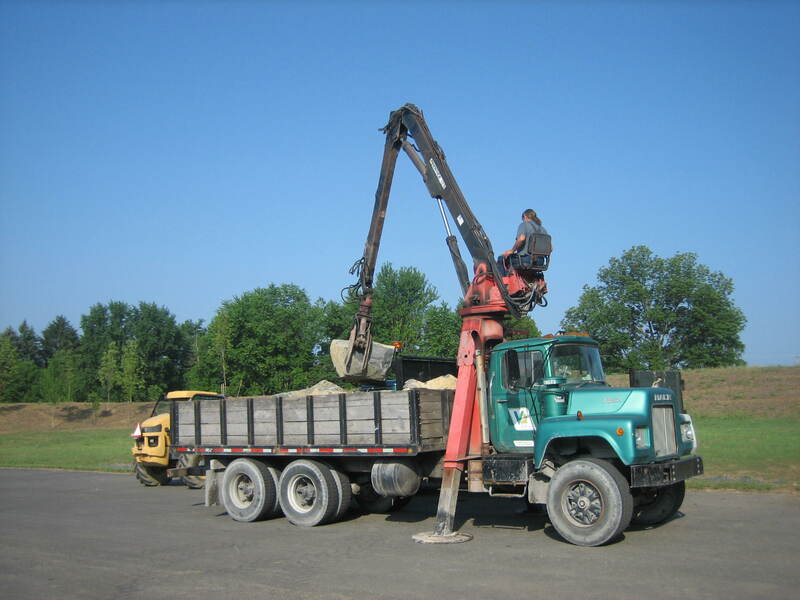 This view shows how the Valley Quarries truck must stabilize itself while it moves the heavy weight of the rocks. This view was taken from the northeast facing southwest at approximately 8:30 AM on Tuesday, July 8, 2008. In the foreground is some of the damaged area in Lot #1. 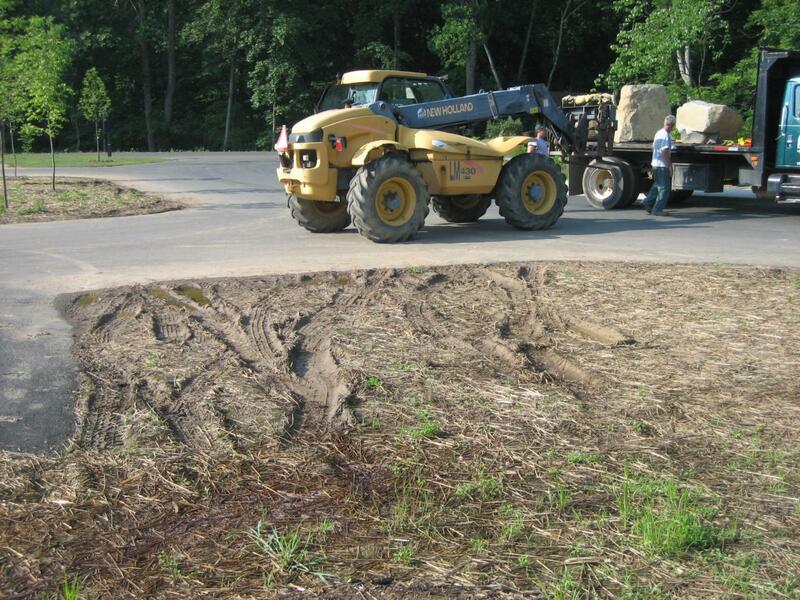 The New Holland machine is preparing to take the rocks off of the truck. This view was taken from the northeast facing southwest at approximately 8:30 AM on Tuesday, July 8, 2008. 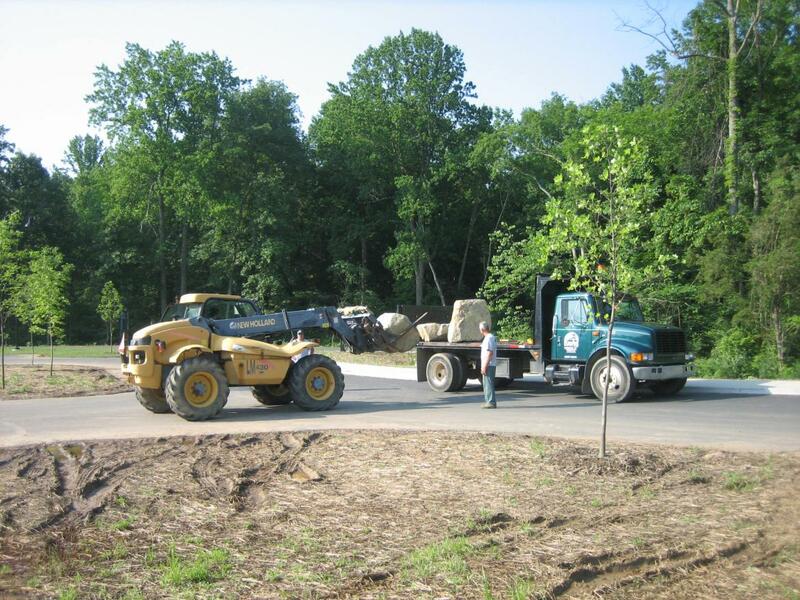 After some maneuvering, the rock was firmly grabbed and taken off the truck. This view was taken from the northeast facing southwest at approximately 8:30 AM on Tuesday, July 8, 2008. The rock is placed on the ground… This view was taken from the north facing south at approximately 8:30 AM on Tuesday, July 8, 2008. … but it’s obviously going to take a lot more rocks to block visitors from parking here in the future. This view was taken from the north facing south at approximately 8:30 AM on Tuesday, July 8, 2008.